What’s in a name? You may come across references in musicological literature to Morag Grant Morag Josephine Grant Morag J. 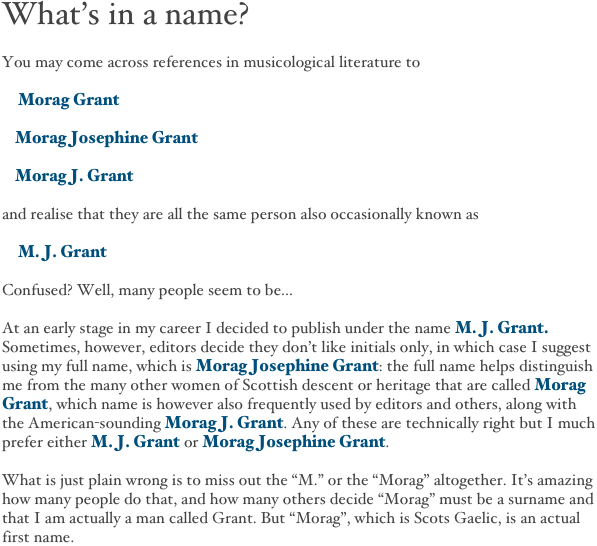 Grant and realise that they are all the same person also occasionally known as M. J. Grant Confused? Well, many people seem to be... At an early stage in my career I decided to publish under the name M. J. Grant. Sometimes, however, editors decide they don’t like initials only, in which case I suggest using my full name, which is Morag Josephine Grant: the full name helps distinguish me from the many other women of Scottish descent or heritage that are called Morag Grant, which name is however also frequently used by editors and others, along with the American-sounding Morag J. Grant. Any of these are technically right but I much prefer either M. J. Grant or Morag Josephine Grant. What is just plain wrong is to miss out the “M.” or the “Morag” altogether. It’s amazing how many people do that, and how many others decide “Morag” must be a surname and that I am actually a man called Grant. But “Morag”, which is Scots Gaelic, is an actual first name.